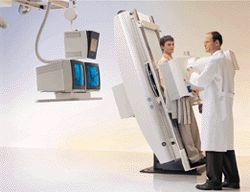 Digital (or computerized) imaging techniques came to x-ray in the 1980s when analog to digital (A/D) converters and computers were also adapted to conventional fluoroscopic image intensifier/TV systems. "Digital imaging" has lead to a similar improvement and renaissance in x-ray just as it has in home and professional audio. Just as many recordings and music albums now sound sharper and better than ever on a digital compact disk (CD) player than on and older (analog) record player, digital x-rays often look sharper and cleaner than the analog version. 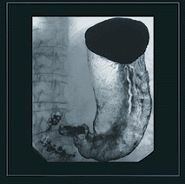 Many of the fluoroscopic ("fluoro" for short) x-ray procedures described herein have benefited greatly from the addition of digital technology. Further, angiographic procedures for looking at the blood vessels in the brain, kidneys, arms and legs, and the blood vessels of the heart all have benefited tremendously from the adaptation of digital technology. Over the next ten to fifteen years a large majority of conventional (basic) x-ray systems will also be upgraded to all digital technology. In addition to digital fluoroscopic systems (described above), eventually, the majority of film cassette/film screen systems will be replaced by digital x-ray detectors. This technology is currently very new and is now available at a handful of sites worldwide. An intermediate step called phosphor plate technology is currently available at hundreds of sites around the world. These plates trap the x-ray energy and require an intermediate processing step to release the stored information so it can be converted into a digital picture. Some modalities like mammography require extremely high resolution film to show the small breast cancers and calcifications. Digital detectors capable of a similarly high resolution are under development and will hopefully be available in the future. However, digital imaging is already being used in parallel to high resolution film in breast imaging and breast biopsy systems.